After yesterday’s sharp gains, today’s moves can be best described as consolidation. The dollar is holding firm but many of the major currencies are positioning for a relief rally. Whether that happens or not will determined by Treasury yields, which are pulling back slightly at the start of the NY session. So far, 10 year rates have yet to breach 3% which is the key level to watch. Euro fell on the back of a weaker German IFO report but recovered all of its losses after bouncing off 1.22. Sterling found a bid from stronger fiscal finances but GBPUSD needs to rise above 1.3965 for the positive momentum to accelerate. There’s no specific explanation for why the New Zealand dollar is the weakest currency but AUD and CAD are vulnerable to short covering if U.S. yields fail to extend higher today. For the U.S., new home sales, consumer confidence and the CaseShiller house price index are scheduled for release. While new home sales could benefit from yesterday’s existing home sales jump, confidence could falter as geopolitical tensions in April rattle the markets. The U.S. dollar is starting the new week with a fresh round of gains as the greenback is trading against all of the major currencies. The main catalyst is the 10 year Treasury yield which is hovering just under 3%. There are no major U.S. economic reports scheduled for release today but last week’s momentum is carrying over to this morning’s trade. The Japanese Yen is the weakest currency followed by the euro which shrugged off upward revisions to EZ PMIs. The commodity currencies are also up across the board although the loonie is the most resilient as oil prices stabilize. Its Monday, so its difficult to say whether there will be continuation after these strong moves but minimally USD/JPY looks like its headed towards 108.50. GBP/USD could test 1.39 but UK yields are up quite a bit this morning as well. The U.S. dollar is trading higher this morning against all of the major currencies as the greenback recuperates from last week’s losses. Global equities also followed the move in U.S. stocks and this morning, Dow futures are pointing to a positive open. Sterling is under the greatest pressure, falling on the back of month end profit taking flows. EUR/USD broke through 1.2400 on the back of softer Eurozone confidence numbers but hasn’t extended its losses YET. USD/CAD is pressing higher despite an uptick in oil prices while the Australian dollar follows gold prices lower. Last night’s Fed comments did not have a significant impact on the dollar though both Mester and Quarles remain optimistic about the outlook for the economy and rate hikes. Looking ahead, US housing data and consumer confidence numbers are scheduled for release. In this otherwise quiet week, confidence data could have a larger than unusual impact on FX trade. 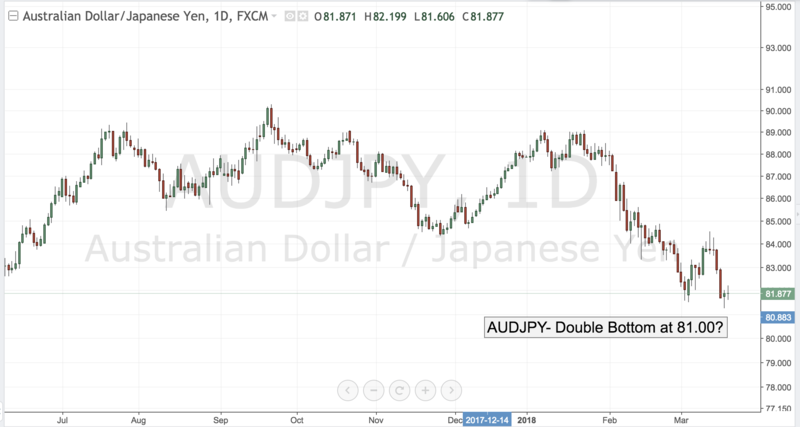 AUDJPY – Double Bottom at 81.00? Tomorrow is the FOMC meeting and the market is focused on both the dot plot and the tone of Jerome Powell’s first press conference as Fed Chair. If Mr. Powell remains upbeat about the US economy and maintains a hawkish bias with regard to US monetary policy that is likely to help USDJPY and all the yen crosses, of which AUDJPY remains the strongest. The biggest story this morning is that USD/JPY is trading above 107.00. The currency pair jumped 100 pips in the past 14 hours on the back of overnight gains in the Nikkei. Asian and European equities shrugged off yesterday’s slide in U.S. stocks and now Dow futures are pointing to a stronger open. 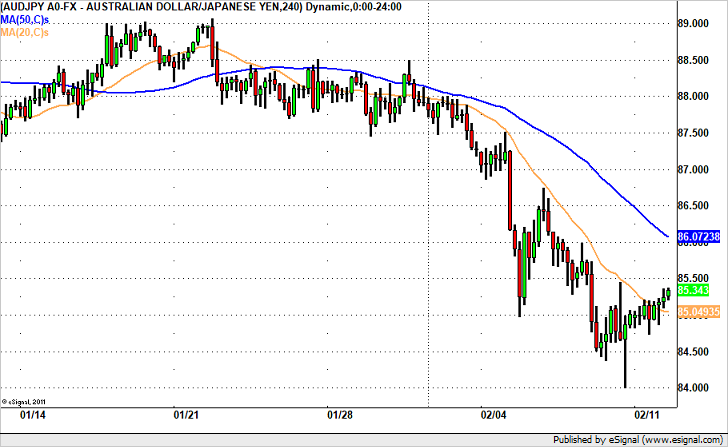 The rally in USD/JPY has taken all of the yen crosses higher and 107.50 is now in sight. EUR/USD remains under pressure but received brief support form ECB Lane’s comment that the current euro level is no concern. Although this view is not new, the fact that it managed to drive EUR/USD up 20 pips in seconds suggest that the currency pair does not want to fall. GBP/USD is hovering just under 1.3900 ahead of the UK’s Spring Statement -- we think the pair will breach this level and finally break to the upside but the statement remains an unclear risk and there are still conflicting Brexit headlines. Next to the Japanese Yen, the New Zealand dollar is the best performer while the Canadian dollar and Australian dollar trail behind. Bank of Canada Governor Poloz will be speaking at 10:15AM NY.